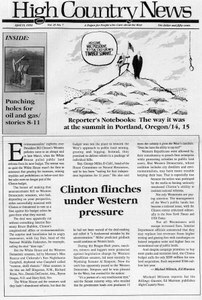 Environmentalists' euphoria over President Bill Clinton's Western policies came to an abrupt end in late March, when the White House pulled public land reforms from its new budget. Durango, Colo., residents charge that gas production pollutes their wells. A re-enactment of the Oregon Trail migration of 1843 is planned. The state Senate softens House anti-green legislation in Idaho. Higher grazing, logging and mining fees are dropped from the budget. A leg-hold trap ban dies in Arizona's rancher-friendly legislature. Michael Frome is axed from the Defenders of Wildlife publication. A bill passed by the state legislature promises mining reform in New Mexico. The military wants to launch missiles from Utah into New Mexico. Book excerpt: "A Hunter's Road, a Journey with Man and Dog across the American Uplands", by Jim Fergus. Ed Marston reflects on his experience at the Forest Summit in Oregon.